Does the name Lew Wallace ring a bell? Perhaps only a contestant on “Jeopardy” would know who he was and even then his career could span two categories – Civil War and Literature. 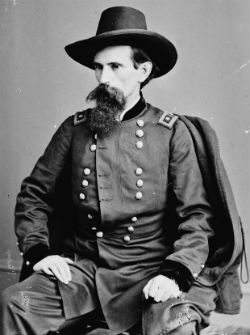 Wallace was born in Indiana, fought in the Mexican War (1846-48), promoted to Brigadier General as the Civil War began in 1865 and aided General Ulysses S. Grant in the early Union victory at Fort Donnellson. Later Grant blamed Wallace for being slow in rushing his artillery to Shiloh – a bloody victory for the North. Sent back to Maryland, Wallace redeemed himself by slowing down the advance of a last desperate Confederate attack on Washington, D.C. which may have played a large part in saving the capital. In 1875 Wallace found himself military governor of New Mexico Territory and bored to tears. A train conversation with leading atheist Robert Ingersoll had stirred Wallace to reexamine his Christian convictions. As he did he compiled research for a book that would prove the best-selling novel of 1800s America. When it came out in 1880, Ben Hur – A Tale of the Christ was an instant success. General Grant read it in thirty hours, mesmerized. The most famous movie based on the book came out in 1959 and was the blockbuster of the post-war years. MGM’s Ben Hur won 11 Academy Awards, the record for the time. 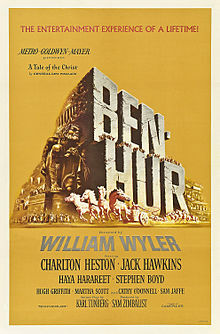 Charlton Heston played the young falsely accused Judah Ben Hur who was sent to the slave galleys. On the way, being herded through Nazareth, Judah is (fictitiously) given a drink of water and a blessing by young Jesus of Nazareth. The novel weaves Jesus’ life in with that of Ben Hur and while slow going in places it compels attention with its description of the arrest, execution and grisly crucifixion of the Christ. Yes, Ben Hur is still one of the great films of all time – you’ll see it for sure on TV this Easter season. One thing that makes it real and gives it it’s “bite” is the scene where Jesus stumbles under his cross on the way to Golgotha. The crack of the whip, the callousness of the Roman guards, the jeers of the bloodthirsty crowd, the heavy music – all this makes for an unforgettable scene as Jesus is seen slowly trudging painfully through the Jerusalem gate to die impaled on a cross outside the city. What some theologians call “the scandal of the cross” has rarely been better portrayed. And the lesson for us as we contemplate the significance of Jesus’ death this week is alluded to by St. Paul in Hebrews 13: “And so Jesus also suffered outside the city gate to make the people holy though his own blood. Let us, then, go to him outside the camp, bearing the disgrace he bore…let us continually offer to God a sacrifice of praise” (verses 12-15). The cross can never be tamed or beautiful. It was part and parcel of the most grisly form of execution even the brutal Romans could devise. The Romans themselves were repelled by it. The orator Cicero hoped that the very word “cross” would one day be expunged forms the lips, minds and thoughts of Rome. In 70AD along the Appian Way the Romans crucified 6000 victims of the famous Spartacus slave revolt. Just think of it – 6000 crosses! However, just that one in Jerusalem was enough to make all Christians shudder when they think of it. First was the stark reminder that the penalty sin extracted even from God himself. Sin must be a terrible thing when even a loyal apostle such as Peter could sometimes be tricked into doing the devil’s work (Matthew 16:22-23). Yes, sin is terrible and unless arrested by sudden decisive action it goes on to take over the whole personality. Judas Iscariot’s resentments, hatred, jealously or whatever it was coursing inside him made him putty in the hands of Satan (John 13:27). Our sins can kill God – it happened. Paul knew that radical sin could only be answered by a radical act of atonement and forgiveness, a decisive intervention by someone from somewhere. The cross symbolizes that intervention of God because deep down in our heart of hearts we know sin has to be atoned for, the scales must be balanced, and the law’s demands must be met. Jesus met these and more at Calvary – site of the cross. Secondly, the cross shows the wonder of God’s love. The fact that he was willing to take on our load of sin and guilt and pay the debt on our behalf shows how much God desires reconciliation, harmony and true Sonship with us, his fallen children. Paul put it this way in Romans 5: “But God demonstrated his own love for us in this: while we were still sinners Christ died for us…For if, when we were enemies we were reconciled to him through the death of his Son, how much more, having been reconciled, shall we be saved by his life” (verses 8-10). There it is: The wonder of his love. Wed didn’t ask for all this. We didn’t even ask to be born into this universe of sin. And yet, somehow, deep down, all people know that the debts we have incurred must be cancelled out. The bill must be paid. The cross represents that payment. Thank God for the scandal of the cross. 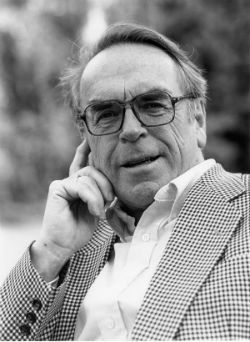 “The helplessness and forsakenness of Christ awakens our compassion…The evangelists tell the story of Christ’s passion in detail, but never with masochistic pleasure…They tell it as God’s history: God with us – with us in our suffering and torment; and God for us – for us in our guilt. They talk about the solidarity of God-become-human – his solidarity with us until death…forsaken by God on the cross, he arrives at the point of our own most profound desolation” (Jesus Christ for today’s world, pages 64-65). “If this Christ is not just one human being among others then his history is first of all an expression of God’s solidarity with the victims of violence and torture. Christ’s cross stands between the countless crosses set up by the powerful and the violent throughout history. It stood in the concentration camps and stands today in Latin America and the Balkans, ad among those tortured by hunger in Africa. His suffering doesn’t orb the suffering of these others of their dignity. He is among them as their brother, as a sign that God shares in our suffering and takes our pain on himself. Among all the unnumbered and unnamed tortured men and women, that ‘Suffering Servant of God’ (Isaiah 53) is always to be found. They are his companions in his suffering because he has become their companion in theirs” (page 65). “I pray also that you may know the hope to which he has called you, the riches of his glorious inheritance in the saints, and his incomparably great power for us who believe. That power is like the working of his mighty strength which he exerted in Christ when he raised him from the dead, and seated him at his right hand in the heavenly realms, far above all rule and authority, power and dominion, and every title that can be given [editor’s note “Caesar!”] not only in the present age but also in the one to come” (Ephesians 1:17-21). There it is. Jesus is not only our fellow-sufferer in our suffering, he is also anointed as our Redeemer and Powerful Savior. The glories of Easter led though the scandal of the cross. Thanks God for his great plan.